I was able to find relevant information in the registry Red is used in the past Blue is now being used (difference is that there is 'Control' ) But I can not need to extract 'EDID' 1. Because [SAM0647 4&386461f0&0&UID50529024] each computer is different [HKEY_LOCAL_MACHINE SYSTEM CurrentControlSet Enum DISPLAY SAM0647 4&386461f0&0&UID50529024 Device Parameters] 2. I can only export have 'Control' of 'Device Parameters' → EDID 3. If there are two 'Control' more than I can extract all 'EDID' it? I not good at English. The good news: each computer now has it's own monitor information listed The bad news: the serial number portion is incorrect As a side note, does the registry store info on every monitor ever connected? I should just have 2 displays on my local computer for example, the laptop screen and one external display. CMN 1474 S/N 00000000, DPC 7401 S/N 16843009, FUS 07B8 S/N 16843009, VSC 6F2E S/N 16843009 The external is a ViewSonic VA-2246M-LED with Model Number VS15451 and a serial number (obfuscated) of TSP####04162. Mobilesyncbrowser Ключ. I'm guessing that the 'VSC' in the registry is referring to the ViewSonic but neither the '6F2E' or the '16843009' numbers help me at all. Thanks again for your help with this! 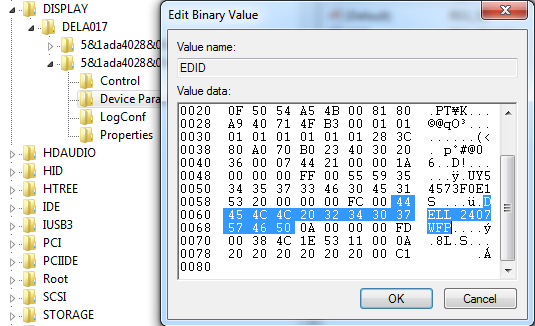 Here is the info displayed by that tool (I sorted columns a bit and am not displaying the unneeded ones to keep this image reasonably sized) Looks like NetScan is grabbing the 'Serial Number (Numeric)' instead of the 'Serial Number'. Apparently you can also determine whether the display is active or not as well as including information such as the week of manufacture, the display size, max resolution, and whether it's a digital connection or analog (helpful to identify which monitor is plugged in with DVI and which with VGA in the case of multiple monitors connected to a laptop dock that only has one of each). There's other info too but nothing that I was interested in. Im trying to create a program or a script to remotely retrieve all the hardwares (computers, printers etc) serialnumbers and I was just wondering if WMI is necessary. I do know about the basic wmic /NODE: 'Computername' bios get serialnumber but this also creates some problems with access as you need administrator rights on both computers if I have understood it correctly and also that the remote computer is configured to allow incoming WMI request. Is it necessary to use WMI for this or are there any other ways to go about this? I know that WMI knows anything you might want to know about a computer but Im interested in the serialnumber only for now, and only on windows enviroments aswell I might add. So if there are any Im looking for tips on any other way around this besides using WMI as it causes alot of other challenges and the goal is to keep it as simple as possible for the user. A script I wrote that gets the serial, make and model from a computer(s) remotely via WMI. Cna Windows K9 Installer 5 8 9 Entertainment. It outputs in the following format: PS.